This document should briefly describe our learnings in Zalando Tech while running Kubernetes on AWS in production. As we just recently started to migrate to Kubernetes, we consider ourselves far from being experts in the field. This document is shared in the hope that others in the community can benefit from our learnings. No manual operations: all cluster updates and operations need to be fully automated. There are many tools out there to provision Kubernetes clusters. We chose to adapt kube-aws as it matches our current way of working on AWS: immutable nodes configured via cloud-init and CloudFormation for declarative infrastructure. CoreOS’ Container Linux perfectly matches our understanding of the node OS: only provide what is needed to run containers, not more. Only one Kubernetes cluster is created per AWS account. We create separated AWS accounts/clusters for production and test environments. We use a custom built Cluster Registry REST service to manage our Kubernetes clusters. Another component (Cluster Lifecycle Manager, CLM) is regularly polling the Cluster Registry and updating clusters to the desired state. The desired state is expressed with CloudFormation and Kubernetes manifests stored in git. Different clusters can use different channel configurations, i.e. some non-critical clusters might use the “alpha” channel with latest features while others rely on the “stable” channel. The channel concept is similar to how CoreOS manages releases of Container Linux. Clusters are automatically updated as soon as changes are merged into the respective branch. Configuration changes are first tested in a separate feature branch, afterwards the pull request to the “dev” branch (channel) is automatically tested end-to-end (this includes the official Kubernetes conformance tests). We provision clusters on AWS and therefore want to integrate with AWS services where possible. The kube2iam daemon conveniently allows to assign an AWS IAM role to a pod by adding an annotation. Our infrastructure components such as the autoscaler use the same mechanism to access the AWS API with special (restricted) IAM roles. Cost efficiency by using SNI and create shared ALBs with up to 25 X509 certificates. We use Skipper as our HTTP proxy to route based on Host header and path. Skipper is running as a DaemonSet on all worker nodes for convenient AWS ASG integration (new nodes are automatically registered in the ALB’s Target Group). Skipper directly comes with a Kubernetes data client to automatically update its routes periodically. External DNS is automatically configuring the Ingress hosts as DNS records in Route53 for us. Stackset Controller provides a more user friendly way of defining the default microservice objects: deployment, service, ingress. It allows to achieve automated blue-green deployments and get rid of many duplication you normally have to write in Kubernetes manifests. Understanding the Kubernetes resource requests and limits is crucial. The default limit for CPU is 3 cores as we discovered that this is a sweet spot for JVM apps to startup quickly. See our LimitRange YAML manifest for details. We stopped using CPU limits, because it slows down our workloads. We wrote a custom admission-controller to make sure that memory requests and limits are equal to reduce the risk of having unresponsive applications, because of a wrong configured container spec. Kubernetes will cause service disruptions on pod terminations by default as applications and configuration need to be prepared for graceful shutdown. By default, pods receive the TERM signal and kube-proxy reconfigures the iptables rules to stop traffic to the pod. The pod will be killed 30s later by a KILL signal if it did not terminate by itself before. Kubernetes expects the container to handle the TERM signal and at least wait some seconds for kube-proxy to change the iptables rules. Note that the readinessProbe behavior does not matter after having received the TERM signal. Keep-alive connections are the default when using connection pools. This means that nearly all client connections between microservices are affected by pod terminations. Kubernetes’ default behavior is a blocker for seamless migration from our AWS/STUPS infrastructure to Kubernetes. In STUPS, single Docker containers run directly on EC2 instances. Graceful container termination is not needed as AWS automatically deregisters EC2 instances and drains connections from the ELB on instance termination. We therefore consider solving the graceful pod termination issue in Kubernetes on the infrastructure level. This would not require any application code changes by our users (application developers). For further reading on the topic, you can find a blog post about graceful shutdown of node.js on Kubernetes, skipper user documentation teardown strategies about how to behave as a backend and a small test app to see the pod termination behavior. We are using the HorizontalPodAutoscaler resource to scale the number of deployment replicas. Pod autoscaling requires implementing graceful pod termination (see above) to downscale safely in all circumstances. We run Kubernetes Metrics Server, combined with our Kube Metrics Adapter to support autoscaling based on number of SQS queue size, Skipper request per second or custom Prometheus query. Additionally we started to use vertical Pod autoscaling to run our Prometheus statefulsets more efficiently. We use the official Cluster Autoscaler which controls the desired capacity of AWS Auto Scaling Groups based on resource requests. Graceful node shutdown is required to allow safe downscaling at any time. We simply added a small systemd unit to run kubectl drain on shutdown. Upscaling or node replacement poses the risk of race conditions between application pods and required system pods (DaemonSet). We have not yet figured out a good way of postponing application scheduling until the node is fully ready. The kubelet’s Ready condition is not enough as it does not ensure that all system pods such as kube-proxy and kube2iam are running. One idea is using taints during node initialization to prevent application pods to be scheduled until the node is fully ready. We use Kubernetes Operational View for ad-hoc insights and troubleshooting. We use the very convenient Kubernetes CronJob resource for various tasks such as updating all our SSH bastion hosts every week. Kubernetes jobs are not cleaned up by default and completed pods are never deleted. Running jobs frequently (like every few minutes) quickly thrashes the Kubernetes API server with unnecessary pod resources. We observed a significant slowdown of the API server with increasing number of completed jobs/pods hanging around. To mitigate this, A small kube-job-cleaner script runs as a CronJob every hour and cleans up completed jobs/pods. We authorize access to the API server via a proprietary webhook which verifies the OAuth Bearer access token and looks up user’s roles via another small REST services (backed historically by LDAP). Access to etcd should be restricted as it holds all of Kubernetes’ cluster data thus allowing tampering when accessed directly. We use flannel as our overlay network which requires etcd by default to configure its network ranges. There is experimental support for the flannel backend to be switched to the Kubernetes API server. This allows restricting etcd access to the master nodes. Kubernetes allows to define PodSecurityPolicy resources to restrict the use of “privileged” containers and similar features which allow privilege escalation. Docker 1.11 to 1.12.5 included an evil bug where the Docker daemon becomes unresponsive (docker ps hangs). We hit this problem every week on at least one of our Kubernetes nodes. Our workaround was upgrading to Docker 1.13 RC2 (we now moved back to 1.12.6 as the fix was backported). We saw some processes getting stuck in “pipe wait” while writing to STDOUT when using the default Docker json logger (root cause was not identified yet). There seem to be a lot more race conditions in Docker and you can find many “Docker daemon hangs” issues reported, we already expect to hit them once in a while. Upgrading Docker clients to 1.13 broke pulls from our Pier One registry (pulls from gcr.io were broken too). We implemented a quick workaround in Pier One until Docker fixed the issue upstream. A thread on Twitter suggested adding the --iptables=false flag for Docker 1.13. We spend some time until we found out that this is a bad idea. NAT for the Flannel overlay network breaks when adding --iptables=false. We learned that Docker can be quite painful to run in production because of the many tiny bugs (race conditions). You can be sure to hit some of them when running enough nodes 24x7. Also better not touch your Docker version once you have a running setup. Kubernetes relies on etcd for storing the state of the whole cluster. Losing etcd consensus makes the Kubernetes API server essentially read only, i.e. no changes can be performed in the cluster. Losing etcd data requires rebuilding the whole cluster state and would probably cause a major downtime. Luckily all data can be restored as long as at least one etcd node is alive. 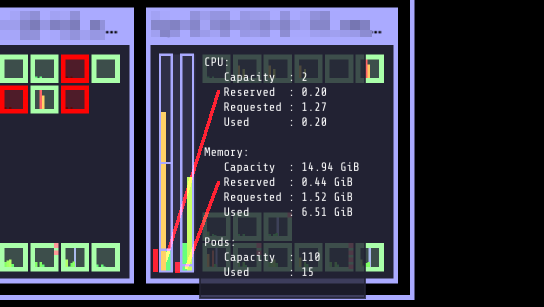 Knowing the criticality of the etcd cluster, we decided to use our existing, production-grade STUPS etcd cluster running on EC2 instances separate from Kubernetes. The STUPS etcd cluster registers all etcd nodes in Route53 DNS and we use etcd’s DNS discovery feature to connect Kubernetes to the etcd nodes. The STUPS etcd cluster is deployed across availability zones (AZ) with five nodes in total. All etcd nodes run our own STUPS Taupage AMI, which (similar to CoreOS) runs a Docker image specified via AWS user data (cloud-init). Communication from worker nodes to etcd is denied with securitygroups in AWS. We run backups as hourly cronjob from the master nodes. We backup using etcd snapshots and upload to S3.